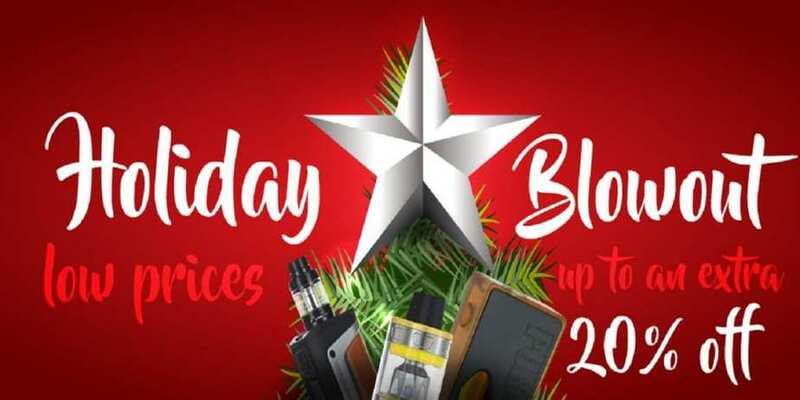 Home → Vape Deals → Vape Mods → EightVape Holiday BLOWOUT Deals! Save An Extra 20% Off! For a limited time only, EightVape is having their Holiday Deals Blowout Sale right here where you can save an extra 20% off select vape gear! No coupon code required! However, you can save an extra $10 off over $75 using coupon code “Santa10“! They have deals as low as only $3.96! During the EightVape Holiday Deals Blowout Sale, you can save an extra 20% off select vape products! They have 8 different types of products to choose from and you can save and additional 15% – 20% off already discounted prices! They do have various products on sale as well such as RDAs, Sub Ohm Tanks, Box Mods and RTAs. Some of the current deals are the Smok X-Force AIO Kit for $12.71, the Lincig Hypnos Pod System for $8.46, the Lost Art Beez Kneez 60ml for $7.99, Bad Drip Dont Care Bear 120ml for $15.16 and much more! More of the deals will be posted below. All in all, this is an excellent store sale! If you are looking to stock up on some new vape products such as hardware, e-juice and accessories for cheap, then this is a deal you definitely cannot miss! Be sure to check this deal out at Eight Vape, where you can get an additional 20% off already low prices! Remember to act fast, this deal is for a limited time only and ends soon!